Probably the most popular and even successful band in history. Formed in Liverpool Lancashire, England . Band members John Lennon, Paul McCartney, George Harrison and Ringo Starr. Forming around 1958 'The Beatles' first sessions in September 1962 produced a minor UK hit, "Love Me Do". Beatlemania began in Britain on 13 October 1963 with a televised appearance at the London Palladium. In the United States Capitol Records (which was owned by EMI), refused to issue the singles Love Me Do, Please Please Me and From Me To You, the reason they gave being that no British act had ever made any impact on an American audience! (maybe that's because the US refused to release the singles or give British acts airplay). Attorneys for Capitol Records were actually employed to stop US DJs from playing Beatles songs. 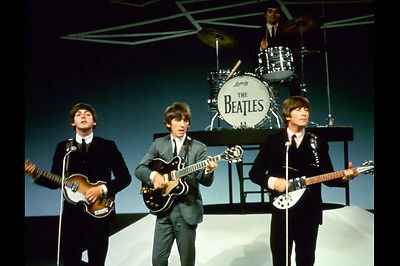 Beatlemania exploded in the United States with three national television appearances by the Beatles on The Ed Sullivan Show on 9, 16 23 February 1964. A record setting 73 million people tuned in that evening making it one of the seminal moments in television history. The 'real' people of the US had their say and the 'establishment' had to concede. In 1964 they held the top five places on the Billboard Hot 100, a feat that has never been repeated. They held and still hold many records in the music industry. Biggest All-Times Sales. 600 million. Most No.1 Singles On UK Charts (Band): 17. Most No.1 Singles On US Charts: 20. Most No.1 Albums On UK Charts. 15. Most US Chart No. 1 Albums: 19. Most US consecutive No.1 Albums: 8. Most UK consecutive No.1 Singles: 11. Most US cumulative weeks at No.1 Albums: 132. Most Albums in the US Top 200 simultaneously: 11. Most recorded song , 'Yesterday'. All top five places on the US Single Charts 1964.